Perpetual e-Motion contras | Indigenize! 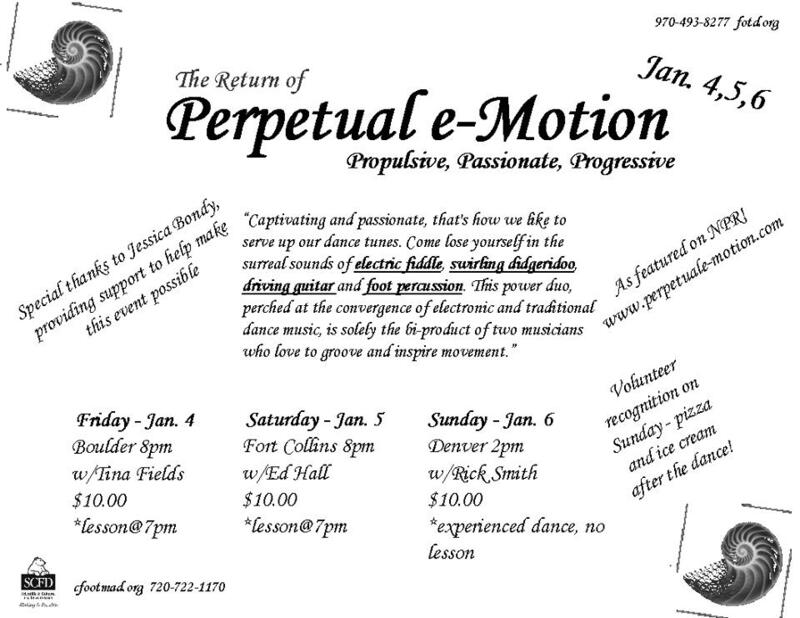 If you love wild contra dancing, the Front Range of Colorado is the place to be this weekend. Perpetual eMotion will play Fri, Sat and Sunday. They are two guys who sound like many more, fusing old traditional tunes with electronic techno looping. Their music makes for dancing that is both rocking and super trance inducing. I’m calling with them on Friday eve at Boulder’s fabulous Avalon Ballroom – and per the dance organizer’s request, I’ll have my disco ball in tow. Two of my favorite callers in the area will call the other dances: Ed Hall in Fort Collins on Saturday, and Rick Smith in Denver on Sunday – and that one will also have ice cream. How good does it get? Hope to see you rollicking out at one or more! Oh you are a lucky girl–love them! Have fun!